We have a robust user-friendly cloud-based client wedding planning portal exclusively offered through our services. It is specifically customized to your unique needs, date and logistical challenges. It’s designed to provide ease and peace throughout your planning journey. Our first big meeting will be to go over the timeline so we know exactly what vendors we need and when we need them for. This will direct the conversations we’ll have with your vendors so we’re not requesting low quotes when really you’ll need them for a lot longer come the wedding day. With a timeline in place you can plan accordingly from a budget and logistics standpoint. Diagram and flow creation for the ceremony and reception. We’ll design tabletop tabletop diagrams for event staff to follow to a T.
We create a rehearsal processional/recessional diagram. One of the biggest challenges we see our clients face is dealing with guests. There is a very small window between sending out invitations to the moment when RSVPs are due. If you don’t have a systematic way of tracking the responses this adds yet another level of complications. 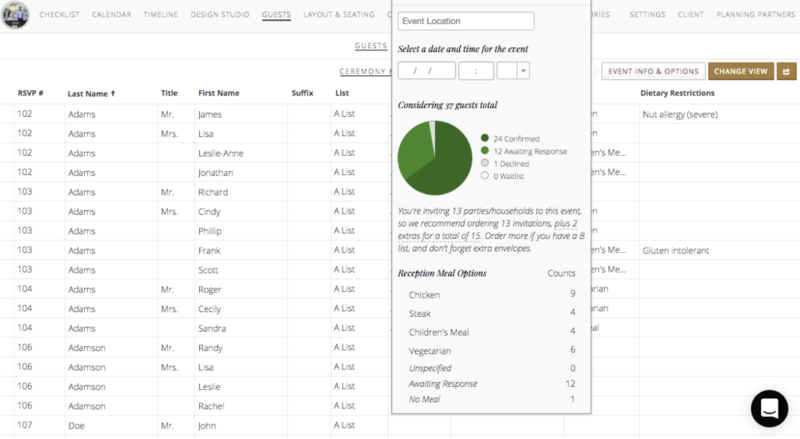 We provide you with an easy tool to keep track of your guests so you can easily mark yes or no for those that have RSVP’d. This list can easily be shared with your calligrapher for those last minute details or you can share it with your caterer so they know exactly which allergies they are dealing with or what meals they need to plan for with your final guest count. If you haven’t quite gotten a chance to check out our reviews, once you do you’ll see how fabulous they are. They aren’t simple one-liners that say, “hire her.“ They go into great detail about how we helped make wedding dreams a reality. While it would be nice to take all the credit, we couldn’t have done it without our external team. When you work with vetted wedding professionals, we can be dedicated to performing our job as your wedding planner versus constantly having to put out fires for uncle Bob’s band or Aunt Marie’s floral business. We help you build a reliable and professional team that you can trust to make your vision a reality. There is nothing more overwhelming than realizing you’ve gone $20,000 over budget. We provided you with a budget tracker where we keep track of your budget, payments, due dates and balances owed. You can see your budget in real time so you always know where you stand in terms of budget. This allows you to make an informed decision about the next expense.